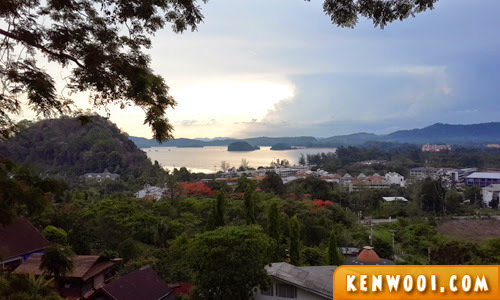 While most of our meals during the Phuket-Krabi trip were simple and cheap, we opted for a higher-end eatery at Ao Nang, Krabi – Lae Lay Grill Seafood. 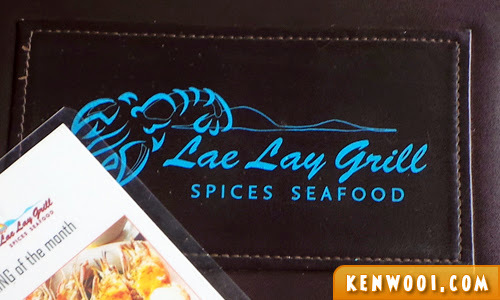 Quick Review: A top recommended place to eat, but Lae Lay Grill Seafood serves food that tastes average. The only notable selling-point is the panaromic view of the sea. 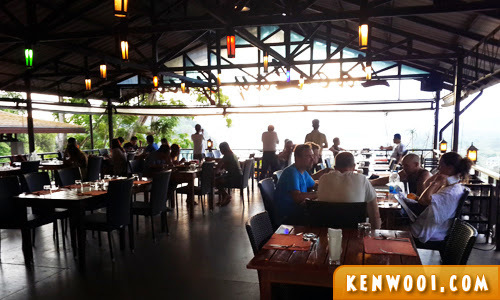 Lae Lay Grill Seafood is well-known for its seafood and breathtaking view overlooking the Andaman sea and mountains across. Weeks before our trip, we made a reservation via their official website and the confirmation was quick. It also came with a complimentary hotel pick-up and drop-off. 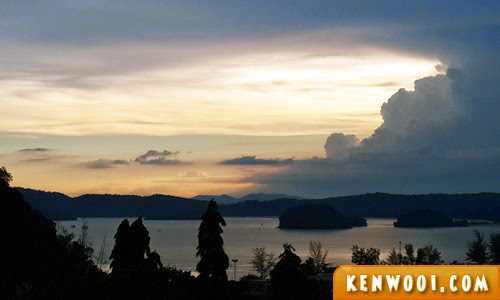 We requested for a 5.30pm pick-up since the sunset at Krabi is about 6.30pm. Fast forward to our stay at Aonang Cliff Beach Resort, we waited at the lobby and the shuttle van arrived on time. The journey to the restaurant took about 5 minutes. 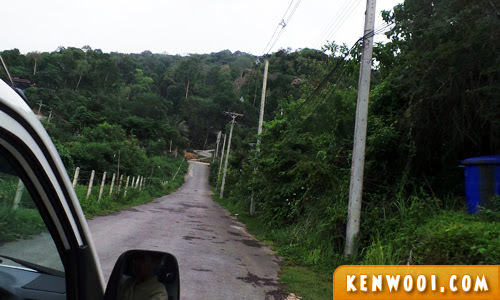 Lae Lay Grill is located on top of a hill – which is probably why they offer transportation services. I’m sure that it would be very tiring for customers to walk/hike up the hill for a meal. Anyway, we arrived just in time to witness the sunset. There are 2 levels at the restaurant. The photo below is the higher level, while we were seated at the lower level. Since we made prior reservations, we managed to get a table along the terrace facing the Nopparat Thara Bay. It isn’t one of the best views I’ve laid my eyes on, but it’s the best Ao Nang could offer. Unfortunately, dark clouds were looming over the skyline. Otherwise, it would have been a clear sight of the sunset. 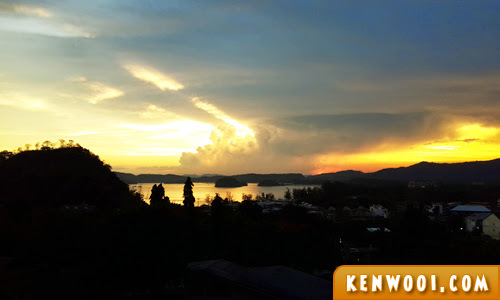 After ordering our preferred Thai food, we continued to gaze over the skyline as the evening skies turned dark. 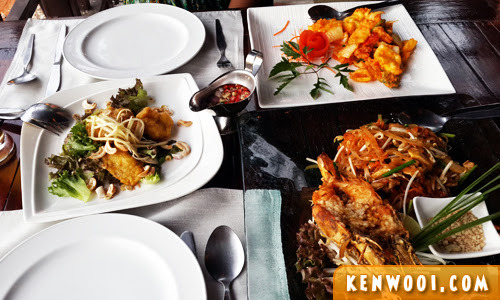 We ordered 3 dishes – Pad Thai, Stir-Fried Salted Egg Squid, and Seafood Salad, priced between THB200 (RM20.56) to THB300 (RM30.84) respectively. There are also “premium” dishes that could cost up to THB700 each (RM71.96), such as lobsters and crabs. The total bill was about THB800 (RM82.24). Honestly, that THB800 could have been well spent on better tasting street food that are much cheaper! Overall, contrary to the excellent online reviews, I personally think that Lae Lay Grill Seafood is overrated. The food was just OK and tasted pretty average. The only notable selling-point of the restaurant was the panaromic view. And of course, the sunset view as well. 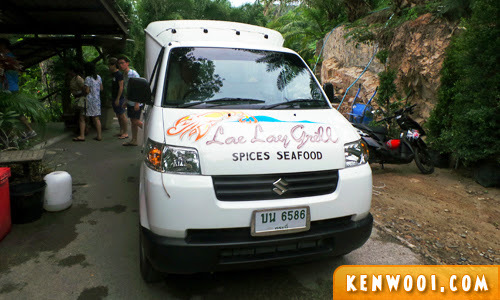 For more info, check out Lae Lay Grill Seafood’s website. Ooooo…beautiful scenic photographs. You take great snapshots, Ken. This must be a classy place, can tell from the presentation of the food.